Large, long-legged birds are comparatively abundant in the late Eocene and early Oligocene of Central Asia, and were assigned to the taxa Eogruidae and Ergilornithidae by earlier authors (e.g., Kurochkin 1976; Olson 1985). However, Clarke et al. (2005a) noted that the Eogruidae are likely to be paraphyletic with respect to the Ergilornithidae, and I follow their proposition to subsume the latter in the taxon Eogruidae, which has taxonomic priority. The first eogruid species was described as Eogrus aeola by Wetmore (1934) on the basis of hindlimb elements from the middle Eocene of Inner Mongolia (China). Olson (1985) recognized that a coracoid from the same locality, which Wetmore (1934) assigned to the Accipitridae, most likely also belongs to Eogrus. Further material of E. aeola was described by Clarke et al. (2005a) from the late Eocene of Mongolia. Two other species of Eogrus, E. crudus Kurochkin, 1981, and E. ("Progrus") turanicus (Bendukidze, 1971), are known from the late Eocene of Mongolia and Kazakhstan, respectively. 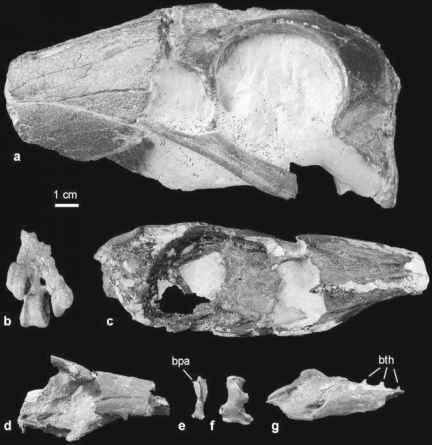 From the early Oligocene of Mongolia, Ergilornis rapidus Kozlova, 1960, E. ("Proergilornis") minor (Kozlova, 1960), and Sonogrus gregalis Kurochkin, 1981 were described (Kurochkin 1976, 1981, 1982; Olson 1985). Eogruids were cursorial birds with a very long and slender tarsometatarsus, which bears a distinct crest along the lateral side of its plantar surface. Kurochkin (1976) considered the possibility that they were sexually dimorphic in size. Within the taxon a progressive reduction of the tarsometatarsal trochlea for the second toe can be recognized. This trochlea was already somewhat reduced in the late Eocene Eogrus, was very small in the early Oligocene Ergilornis and Sonogrus, and was almost completely lost in the Neogene Amphipelargus ("Urmiornis"), which existed until the middle Pliocene in Western Asia and Europe (Olson 1985). Whereas many hindlimbs elements of Paleogene eogruids have been discovered, little is known about other aspects of their skeleton. According to Kurochkin (1976) the morphology of an incomplete humerus of Ergilornis from the early Oligocene of Mongolia indicates that this taxon was flightless. Concerning Eogrus, however, Clarke et al. (2005a) noted that a referred proximal phalanx of the major wing digit does not show indications of flightlessness. Olson (1985) hypothesized that eogruids are stem group representatives of the palaeognathous Struthionidae, but apart from the reduction of the tarsometatarsal trochlea for the second toe, there exists no evidence in support of this hypothesis. Wetmore (1934) assumed that these birds were related to the Gruidae, and they were considered to be the sister taxon of the Gruoidea by Cracraft (1973a, Fig. 46). In a cladistic analysis of Clarke et al. (2005a), eogruids resulted as a sister taxon of the clade (Aramidae + Gruidae). In this study a single character was optimized as an apomorphy of a clade including the Eogruidae, Psophiidae, Aramidae, and Gruidae (notched distal rim of the medial condyle of the tibiotarsus), and another one supported a sister group relationship to the Grues (tarsometatarsal trochlea for the second toe subequal in distal projection to that for the fourth toe). None of these characters are, however, restricted to the taxa in question. If Olson's (1985) identification of the Eogrus coracoid is correct (see above), the bone differed from the coracoid of extant Gruoidea in the absence of pneumatic openings in the dorsal surface of the sternal extremity, and its morphology would conflict with a sister group relationship between the Eogruidae and Grues.